Camera Obscura "My Maudlin Career"
Somehow I was late on the Camera Obscura scene. I remember thinking they were a little too twee for my liking, a little too much like Belle and Sebastian. Yet somewhere through my third or fourth go-round of Let's Get Out of This Country, something clicked for me, and I became a huge fan. I spun that record and their equally awesome Underachievers Please Try Harder pretty much regularly after that. So it's been a few years since my early bender, and now we have their new record My Maudlin Career coming out on April 21st via 4AD -- their first post-Merge release. I'm eager to hear how their sound has developed, but from the P.R. it seems to be "darker" and "more intense." 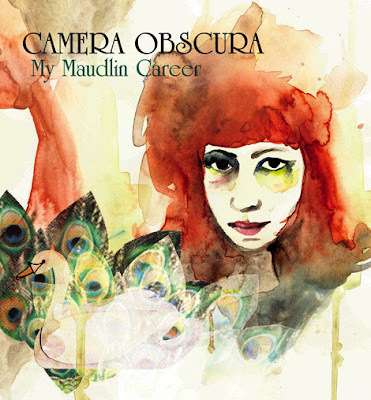 We have the first mp3 "My Maudlin Career" available for you above. Tickets for their Mar 24 show at the Bell House are reportedly almost sold out, but they announced a show on the 25th at the Mercury Lounge that is on sale now. Tour dates and track list after the jump.